A rich, earth-tone inspired backdrop and custom graphic elements help this new church theme design to really make an impression. And of course, just as important as the visual impact of this new theme, is the underllying user-friendliness of the WordPress content management system. 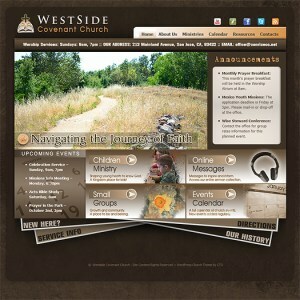 With this new church theme, you get both world-class design, and impressive CMS functionality. And even better, being that this is a responsive WordPress church theme, your congregation's new website will look good on a broad assortment of media devices.